Whether you’re at all interested in getting to know the music of Friedrich Gernsheim, simply reading through the extensive sleeve-notes by Jens F Laurson should tell you all you’d ever wish to know – and more besides – about the composer’s life. The subtitle, ‘From Child Prodigy to Forgotten Brahmsian’ sums things up in a nutshell, although the chronological detail with which Laurson fleshes this out is quite exhaustive. In terms of specific effects on the music itself, Gernsheim’s reported Paris meeting with the sixty-five-year-old Rossini – the German composer was a mere eighteen at the time – did have some bearing. At this meeting Rossini said: “Voyez mon ami, l’essentiel dans la musique c’est la mélodie!” (“Observe, my friend, the essence of music lies in melody!”) – something which both Gernsheim, and Brahms (1833-1897) took to heart. Gernsheim was born in Worms and received his first musical training at home from his mother. From the age of seven his tutor was Worms’s musical director, Louis Liebe, a former pupil of Spohr. Gernsheim’s father, a prominent Jewish physician, moved the family to Frankfurt am Main in the aftermath of the political upheavals of 1848. Friedrich made his first public appearance as a concert pianist in 1850, touring for two seasons, before settling with his family in Leipzig in 1852, where he continued his piano studies with Moscheles. From 1855 he spent the next five years in Paris, where he met Lalo, Saint-Saëns and Rossini, before returning to Germany. There he remained until his death in Berlin, except for an extended period as musical director of the Philharmonic Society of Rotterdam, where he became known as the ‘Dutch Brahms’. This was a significant change from his early nickname of ‘le petit Mozart’ when he was being paraded around as a ten-year-old child prodigy along the Rhine. A prolific composer, especially of orchestral, chamber, instrumental music and songs, some of his works tend towards Jewish subject-matter. His earlier output shows the influence of Schumann, and from 1868, when he first became friendly with Brahms, that composer’s influence is palpable. Due to Gernsheim’s Jewish background, his work was banned in Nazi Germany, and his papers and a biography written about him by musicologist Karl Holl were removed from music libraries. The Violin Concerto No 1 is in what might be termed the prescribed, violin-friendly key of choice – D major. Beethoven had already used it in his work in 1806, and, so had Tchaikovsky and, more pertinently, Brahms in 1878, just two years in fact before Gernsheim’s concerto. The insistent timpani part that opens the work might remind the listener initially of Beethoven’s concerto, but it is the shadow of Brahms that permeates the first movement (‘Allegro con brio’). There is the expected cadenza, though this comes at the end of the development before the recapitulation of the opening material. The slow movement (marked ‘Andante affetuoso’) has a distinct melodic charm, and the choice of key (F sharp minor) provides an effective link, given that F sharp is the third (middle note) in the home key triad of D major. As the Andante finally comes to rest in F sharp major, the link back to the finale is effective. The opening of the finale – ‘Allegro energico e con brio’ – uncannily calls to mind the same moment in Bruch’s first concerto just a couple of years earlier, in terms of melody, rhythm and solo writing. It even shares the ‘Allegro energico’ marking. There are reposeful sections along the way and Gernsheim finally generates enough momentum to reach a sufficiently convincing close. The Fantasy in D major followed in 1876, and is certainly a pleasant enough work, eminently tuneful and capable of holding the listener’s attention for all of its ten minutes or so. The Violin Concerto No. 2 was written in 1912. Its premiere at one of the Hamburg Philharmonic concerts was described as a rousing, ‘sensational success’. 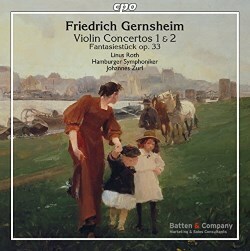 Gernsheim has admittedly moved on somewhat in the thirty or so years separating his two violin concertos but, in fact, this has rather resulted in a lack of spontaneous melodic outpouring in the later work. Laurson refers to it as a ‘concentration of the expressive means … he is less inclined to include schmaltz and sugar in the musical recipe than he was in his early works’. Indeed, with the cadenza coming after just a minute’s playing-time, there is a more serious-minded tone overall. The opening, marked ‘Allegro risoluto’ does have a ‘resolute’, rather than a melodious feel, and while there is relief and a ‘happy ending’ in the finale (‘Allegro giocoso’) it lacks real sparkle. On the other hand, the slow movement – ‘Andante cantabile’ – is seven minutes of pure Romantic nostalgia, where the violin gets every opportunity to ‘sing’, something the tempo marking demands. Soloist, Linus Roth, certainly obliges for his part. It is not surprising that the well-intentioned German CPO label should especially want to promote composers from its own land. The ravages of time have caused such figures to be virtually forgotten. Add to this, particularly in the case of Gernsheim and many other composers of his generation and ethnicity, that the odds have additionally been stacked heavily against them. While Laurson does try to plead a convincing case for the composer – as does the soloist’s and orchestra’s performance – he rather appears to answer his own concern about Gernsheim and his music, when he writes: ‘Even if we have never heard it before, Gernsheim’s music immediately seems familiar to us because it was written in the spirit of German romanticism with influences from Mendelssohn, Schumann, Brahms, and Bruch.’ However pleasant, tuneful, even more than a tad derivative it might be, it really doesn’t stand out from the crowd, nor have anything special to say. This is something, perhaps, of which even Gernsheim was aware at times. Indeed he sometimes doubted whether composing, which apparently did not come easily to him, was worth all the trouble. Occasionally he turned for advice to his friend and mentor, Ferdinand Hiller, who, in 1865, had appointed him to the staff of the Cologne Conservatory. Naturally Hiller always took great pains to ensure that he sent Gernsheim away, buoyed up and fully-convinced once more of his prowess as a composer.